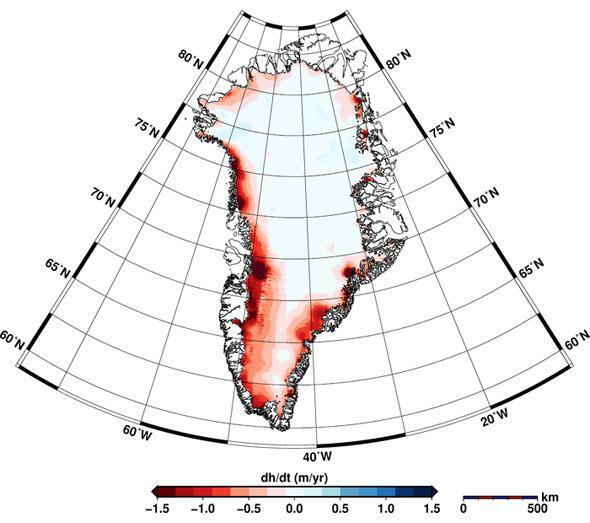 CryoSat-2 measurements of Greenland showing ice loss. Dark red is a loss of 1 meter of height per year, black is greater than 1.5 m/yr. A new study just published shows that—using more accurate measurements than ever before—Greenland and Antarctica are together losing ice at incredible rates: Together, over 500 (±107) cubic kilometers of ice are melting from them every year. That means 450 billion tons of ice are lost every year, melted away into the oceans. That’s staggering. Tim Radford at the Guardian has the story. In a nutshell, the European CryoSat-2 satellite measures the height of the ice over the two land masses. As they lose ice, the height drops, and that change is seen by the satellite. This loss is of course due to global warming; we’ve known for some time that land masses at both poles are melting away their ice, but these new measurements confirm the bad news, and give more accurate numbers. They also found that West Antarctica—the focus of much concern lately—is losing ice three times faster now than it was in the time period from 2003–2009. That’s astonishing. Note that they did find a mild increase in ice in eastern Antarctica, which was known before as well, but it’s not nearly enough to compensate for the huge losses elsewhere (in other words, beware of The Usual Suspects trying to use this to say land ice is increasing). I can’t help but mention that I saw this news literally the day after an atrocious Mail Online article also reported on satellite imagery of the North Pole but then grossly misinterpreted it to make the claim that Arctic sea ice is recovering from the record loss in 2012. As I pointed out yesterday, that claim is just so much fertilizer. The contrast between the Mail reporting and that of the Guardian can’t be more different. The latter is trustworthy, the former … less so. Be careful where you get your news about anything, of course, and especially when it’s about scientific issues that have become political ones. It seems that a lot of venues out there are going to great lengths to keep people in the dark about global warming. I will do what I can to shine a light on them. Tip o’ the snow plow to Dana Nuccitelli.